Ice cream melting in the sun. Various tastes flow into each other while creating new and fascinating shapes and color combinations. With this feeling in mind, we set out to create the new corporate design concept for the first pure vegan ice cream shop in Graz called “Die Eisperle”. Ice cream melting in the sun. Various tastes flow into each other while creating new and fascinating shapes and color combinations. With this feeling in mind, we set out to create the new corporate design concept for the first pure vegan ice cream shop in Graz called “Die Eisperle”. 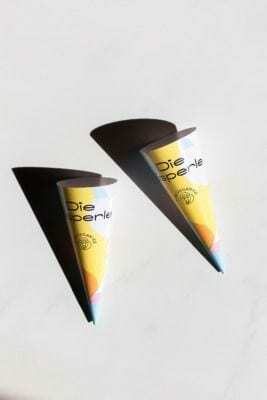 The versatile form and color combinations vary on every touch point and communicate a ‘summerly’ attitude to life while showing the creative and adventurous approach of Die Eisperle’s curious ice cream varieties. The signet shows the personal ice cream moment and can be adapted to any personality type—because ice cream is something for everyone.